Trim stems and store in a glass of water on the kitchen counter. If refrigerating, cover with a plastic bag. Parsley is a good source of Protein, Vitamin E (Alpha Tocopherol), Thiamin, Riboflavin, Niacin, Vitamin B6, Pantothenic Acid, Phosphorus and Zinc, and a very good source of Dietary Fiber, Vitamin A, Vitamin C, Vitamin K, Folate, Calcium, Iron, Magnesium, Potassium, Copper and Manganese. It is best to add Parsley near the end of cooking a dish to ensure the best flavor. The word Parsley comes from the Greek Petros being stone as it was often found growing amongst rocks. 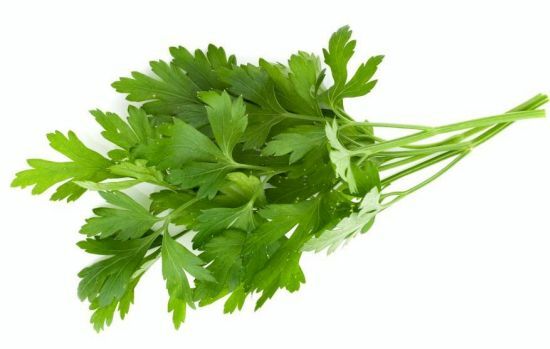 Ancient Greeks believed that Parsley sprung from the blood of the hero Archimedes after he slayed a dragon. Parsley is a natural breath freshener and is often added to shampoos.